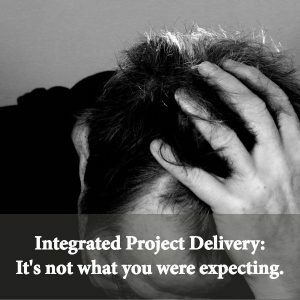 Integrated Project Delivery (IPD) is a form of contracting for engineering, architectural and construction services with “one entity.” In theory, it sounds great. In practice, it has been extraordinarily complicated for you, the owner. Why go with IPD when the Enhanced Design-Build Method is available? Our colleagues at the American Institute of Architects describe it this way: “Integrated Project Delivery (IPD) is a project delivery approach that integrates people, systems, business structures and practices into a process that collaboratively harnesses the talents and insights of all participants to optimize project results, increase value to the owner, reduce waste, and maximize efficiency through all phases of design, fabrication, and construction. IPD aspires and presents itself as a better solution for the owner when, in practice, it is the same old set of owner problems dressed up as a new term. Reading between the lines reveals that IPD is a “collaboration” among a “triad of owner, architect and contractor,” each being individual business entities. In practice, the owner is still contracting with competing interests and remains highly susceptible to the costly ineffective “blame game.” Expect the change orders to continue. McCree is what IPD aspires to be. Our Enhanced Design-Build method actually is one contracting and delivery team under one ownership with a single point of contact for the owner. It is one relationship with one responsibility and one commitment: Care for the Customer!